Mice are good jumpers, climbers, and swimmers and despite their tiny bodies and they can eat between 15-20 times a day. Speaking of their tiny bodies, did you know that an average adult mouse can fit through a hole the size of a dime? And if the hole is too small they can use their sharp teeth to make the hole bigger in order to fit through it. 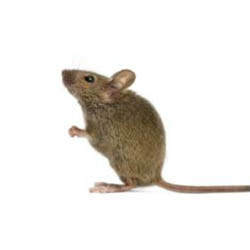 Mice typically try to enter homes between October and February, looking for food, water, and shelter from the cold. They can carry as many as 200 human pathogens and can spread diseases by contaminating food and water with their waste. Rats are scavengers. They have an excellent sense of taste and a good memory. A rat can identify certain substances just after a tiny taste. This includes rat poison. Be sure to keep your home clean and do not leave food out. Empty kitchen and household garbage on a regular basis. Close up any small holes and cracks they can come in through. 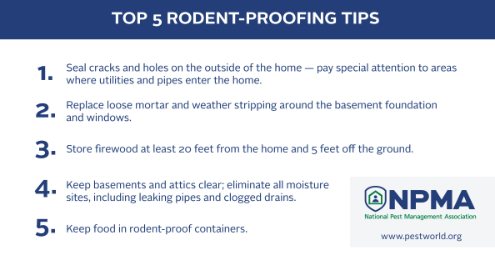 Copper mesh, steel wool, and caulking are all good materials to use to close up holes as mice like to use only soft materials to make their nests.